Per reader request (thanks, Kaneisha and Sarah M! ), I will be posting a vegan/vegetarian recipe each week in honor of Meat-Free Monday. I’ll do my best to post on Sundays so people will have a chance to purchase their ingredients for Monday. This is a wonderfully hearty recipe and one of my personal faves as it’s the first recipe I ever created. 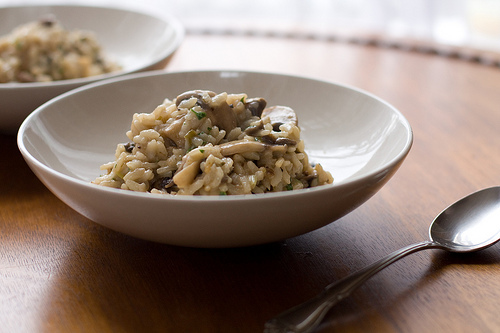 Arborio rice gives risotto dishes their incredibly creamy consistency. Many people are intimidated by cooking risotto but don’t be! All you have to remember is that risotto is like a rambunctious toddler — you must keep an eye on it at all times. Just stir VERY frequently and add a little bit of liquid at a time as you go and you will have a delicious dish. If you have any questions or would like me to post a particular kind of recipe (desserts, brunch recipes, etc. ), just let me know. Happy cooking! 1. Pour olive oil and arborio rice into large pot. Stir well and turn stove to in between medium and high heat. 2. When rice starts to sizzle, pour 1 cup of vegetable broth and 1 cup of wine. Stir. 3. When it begins to boil, reduce heat, add mushrooms, green beans and garlic powder, and let simmer for duration of cooking. 4. Keep stirring and adding 1/2 cup of broth as needed. This should take approximately 20 minutes to cook. You’ll know the rice is done when it’s creamy and slightly firm but not too chewy. 5. When done, take pot off of stove. Add soy butter, dill, salt and pepper. Stir well and let sit for a few minutes. Serves 3-4, depending on how large you like your portions. Image by Ryan Yu via Flickr and the Creative Commons License. Tags: food, recipe, risotto, vegan. Bookmark the permalink.